The challenge of sustainable development is beyond you and I, isn’t it? We need to work together in partnerships and multi-stakeholder intiatives (MSIs), but we lead different organisations. So, how do we build these relationships and design for impact with others? Achieving deep and shared understanding, values and partnership takes what we call, ‘EXTREME ENGAGEMENT’. We’ve been working with NGOs, business and institutions, long enough to know organisations work at different paces, speak different ‘languages’ and prioritise different things. We know how hard it is to lift out of one’s own organisational pressures to create new strategies. Organisations can succeed in creating breakthrough partnerships and then struggle to bring their own organisations along. Initiatives can be established and then falter as people move on and relationships change. It’s a challenging journey, but with ‘extreme engagement’ one can achieve more transformational change. Identify – Clarify – Understand – Empathise – Lead. Identify the different perspectives to begin the process of engagement and each time new challenges/opportunities arise. Clarify points of view, perspectives and possibilities. Develop a deeper understanding of the drivers, motivations and scenarios. Empathise, stepping in to the shoes of others. Extreme listening: Listen twice as hard as you speak and be self-aware. Your own perspective is at work, so use the ladder of inference to take an objective view. Extreme immersion: Build a deep understanding of your key stakeholders (internal and external, supporter and detractor), what drives them, what do they need, what are their pressures? Our next blog features tools for immersion. Extreme insight: Hold up a mirror to your organisation and partners. Give people the space and experiences to see different perspectives, co-create ideas and be part of the change. The science of persuasion can help you engage others. In our planning for impact blog we will share more of the tools to go beyond engagement to extreme engagement. The key is to go deeper with interviews with stakeholders and thought leaders, co-creation groups, online listening, and other methods. 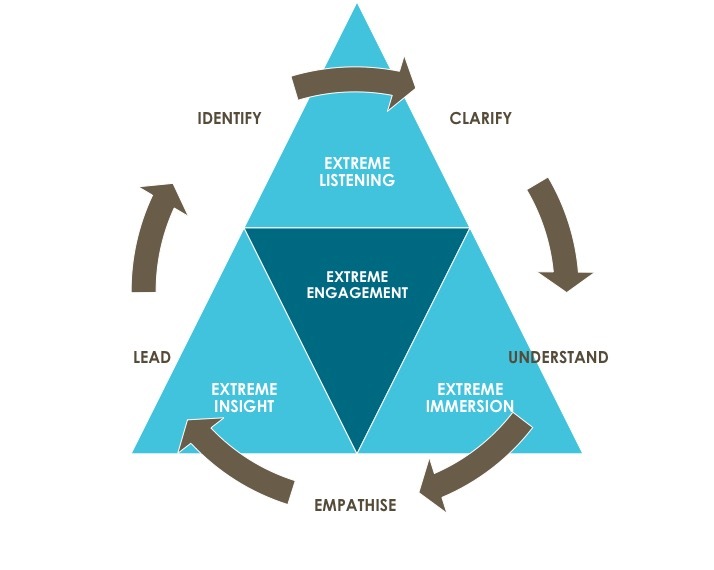 In summary, ‘extreme engagement’ is about working with your internal and external stakeholders and partners with a conviction to genuinely move organisations forwards. It is about deeply understanding barriers and constraints, as well as opportunities, to create sustainable change. It is setting out what you want to achieve but also HOW you will really achieve it. ‘Extreme engagement’ is a continuous process, from partnership brokering and design, through to evaluation and renewal. Like any relationship, you need to put in time and effort, but with ‘extreme engagement’ you can energise yourself and your organisation as well as achieve real impact. Rachael Clay set up Ethicore in 2008 to help organisations have a bigger impact through insight, engagement and partnership. She has over twenty years experience working with business, NGOs and institutions. Rachael is expert in research, stakeholder engagement, facilitation, strategy and partnership.